The U.S. Department of Labor’s Round 4 Trade Adjustment Assistance Community College and Career Training or TAACCCT grants closed out in November, wrapping up New Growth’s run of nine TAACCCT evaluations over seven years. TAACCCT grants funded community colleges across the country to create or improve training programs in manufacturing, transportation, and energy industries, among others. Although each grant funded initiative was unique, our cumulative experience surfaced a number of best practices for both colleges and evaluators. For colleges we learned more about effective practices for student success and how consortiums can serve as hubs for information and resource sharing. From the evaluation standpoint, we were able to identify practices that will sharpen our data collection and strengthen our reports. 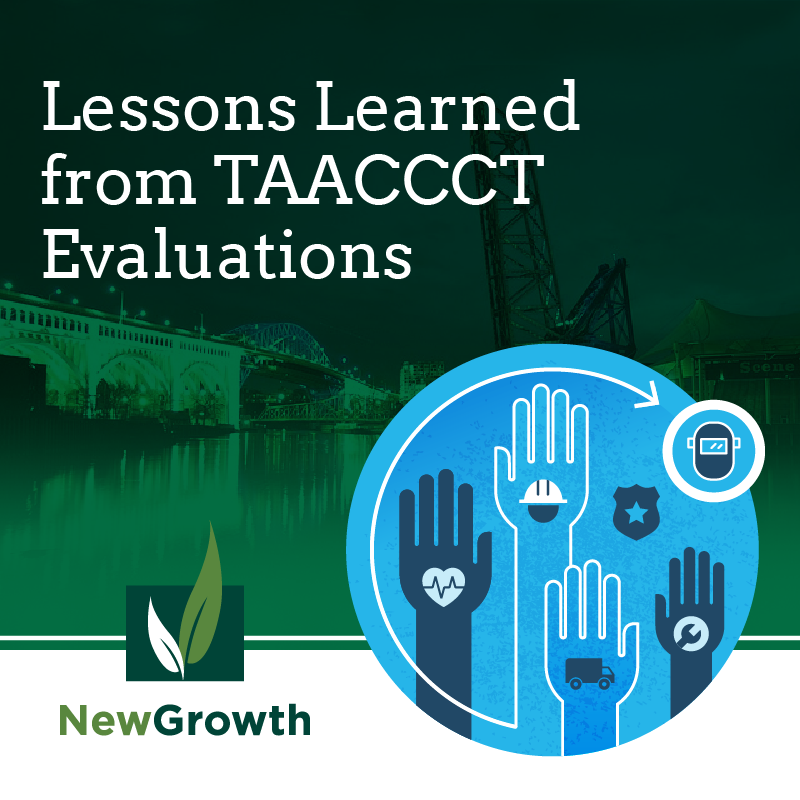 Overall, for the TAACCCT grants that New Growth evaluated, students who were enrolled in grant-funded programs did better than comparison group students. New Growth found that students enrolled in TAACCCT programs were more likely to earn a certificate and those who completed were more likely to find employment than the comparison groups. This success can broadly be attributed to three factors which were consistent throughout successful TAACCCT programs. Short-term, stackable credentials: Offering short-term certificates accelerated student completion. Indeed, some TAACCCT students were able to earn a credential in a few weeks. Many of the programs evaluated also made these credentials stackable, which created a flexible career pathway for students. Supportive services: Many TAACCCT funded colleges hired a Student Navigator to provide recruitment, advising, coaching, and general student engagement to support students through completion. At the conclusion of the grant, program staff resoundingly expressed that the navigator role positively affected enrollments and completions. Employer engagement: Employers were a principal partner working with colleges to improve programs, as well as clients or end-users of the new and improved programs and pathways developed through TAACCCT. Colleges worked to expand and improve their employer relationships which helped the colleges improve disconnects between college curricula and industry skill needs, fully utilize best practices such as learn-and-earn, apprenticeships, or flexible program designs for incumbent workers in instructional models, and encourage hiring. Many of the TAACCCT grants New Growth evaluated were awarded to consortiums of colleges. These consortiums helped the colleges not only attract additional resources, but served as an information sharing network for innovative and best practices. Through the consortium, individual colleges were able to improve their own programs and build a regional identity. Many of the partnerships developed through TAACCCT have maintained after the grant ended. These consortiums continue to work together, sharing best practices, expanding the network of collaborators, and aligning resources for continued funding. Evaluating the TAACCCT grants also gave us a chance to reflect on our own practices. Through our nine evaluations, we learned a lot about obtaining employment data and connecting it to educational outcomes, in addition to effectively telling the implementation story through qualitative data. Employment Data: As we have reflected before, while it is possible in most cases to obtain employment and wage data, it is not without its challenges. In order to obtain state employment and wage data for TAACCCT grants, conversations started at least two years prior to the end of each four-year evaluation. New Growth worked with the administrators of each state wage database to navigate the data privacy laws and establish strong data sharing agreements. While each state collected the same data, the data privacy laws vary by state. These laws dictated the kind of data we were able to access, some states gave us individual wage records, while others would give us aggregated employment status only. A handful of states did not give us employment data at all. Data privacy laws are not stagnant, and often change in response to technological advancements and new administrations. When evaluating, it is important to remain flexible, and use the strongest data available to assess the impact of programs. Qualitative Data: In addition to evaluating the impact, New Growth used qualitative data to document the implementation of the program. An implementation analysis helps tell the story of the program, documenting how the college addressed challenges and built the infrastructure necessary to produce outcomes. To effectively relay this information, we walked the reader through the process the college used to meet the outcome. For TAACCCT evaluations, our reports often detailed both how students made their way through the program and how colleges effectively engaged employers. For those colleges in consortiums, we also looked at the effectiveness of the partnership. Detailing these processes in the reports not only helps the funding program officer build a knowledge base for future grant opportunities, it is also useful to the grant-funded colleges providing them information to help them sustain and strengthen their programs. While the TAACCCT grants will not be reintroduced, the best practices developed through them can help community colleges build programs which successfully train students with the skills needed to thrive in their local labor markets. Want to learn more about best practices or have an evaluation question? Reach out to our team of experts! We have helped community colleges from across the nation build, resource, implement and evaluate successful training programs.